Kyle and I have recently been reminded of a pretty good problem to have: We have a ton of gift cards and we have no plan for spending them! 1) I think we might receive more than the average people because I, particularly, am very difficult to buy for. 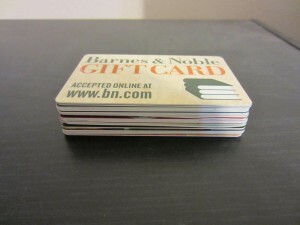 People know that I like to read so they tend to give me gift cards to booksellers (we have a lot to Barnes and Noble!) and Kyle for years received Blockbuster gift cards because he likes video games. We actually bought a video game system a few years ago just using his Blockbuster gift cards, but he still has more! We also live superfar away from all our family and gift cards are easy to mail. 2) We rarely create opportunity to use the cards. Our spending on things since we got married has really fallen off a cliff. We have lots of cards to retailers we don’t ever visit (Walmart) and places that we used to frequent we don’t any longer. I visit the library now and buying books never even crosses my mind! 3) When we do buy something, we forget to check if we have a gift card and we can’t remember because we use them so infrequently. For instance, we bought some luggage at Macy’s a few weeks ago. We didn’t know that we were going to visit that particular retailer that evening and we had forgotten that we had a card there from our wedding gifts. 1) Go through the stack and sort into retailers that we will reasonably visit and ones that we will not. 2) Sell the cards that we really won’t use on one of those online exchanges. I’ve never done this before, but I found a great post on it at My Money Blog. 3) Make a spreadsheet of the cards with balances for reference when we are planning a buy (online or in-store). 4) Keep the cards we will use in our car along with a copy of the spreadsheet so that if we spontaneously visit a retailer we will have the cards on hand. The two types of cards I’m excited about using immediately because they will replace cash in our budget: Target ones left over from our wedding gifts (we get some groceries and toiletries there) and the CVS/pharmacy one I just ordered from my vegetable-eating and working-out records from our health insurance company (we get our BC and some toiletries there). So no additional spending, just savings! How do you handle gift cards – do you have a lot and do you have a system for dealing with them? What do you think of my proposal? Which online gift card exchange is your favorite and what do you do with cards with small balances? 27 Responses to "We Have Too Many Gift Cards!" I don’t get gift cards very often but when I do I make sure to use it within two months…I hate holding on to them. I got a ton of gift cards from my wedding and I created a spreadsheet of how many, how much, and who it was from. Then I went to the stores (I had to return duplicate gifts to Target and Bed Bath & Beyond anyway) and got all the gift cards combined into one gift card so that my wallet wouldn’t be so packed and the number of gift cards doesn’t seem so overwhelming. If you are going to sell yours, it might be a good idea to combine them so you can sell it at one go. I think the problem really started for us when Kyle removed his gift cards from his wallet (my wallet is tiny so I’ve never carried any of mine). Then they were really out of sight, out of mind! That’s a good idea to combine them – I didn’t realize retailers did that. I have a lot of gift cards also! I need to start using them. Like others said, maybe regift? We don’t really have a system but we get around to using them. We’ve had some gift cards for over a year but they’ll get spent eventually. We use most of the store cards (Walmart or Target) but we definitely have a tough time using up the restaurant cards. I wish people would never give me gift cards for anywhere but Amazon. I hardly ever go to the store anymore, and most of what I buy comes from there anyway. Haha concur. We’ve received a few amazon gift certificates and we have NO trouble spending them! This is fascinating! I’ve never really been given a GC to a restaurant chain or grocery store. I’m not big on most chains either, but maybe they’d have good salads…? I’d be interested in your experience with selling back the GC. We had a few hundred of BB&B credit after the wedding. I only really registered there because my mom’s friends *LOVE* the store, but I ended up taking most the stuff back. haha. We’ve used the money to buy wedding/birthday gifts, etc. since then. So in a sense, it’s “regifting”. We have a drawer for GCs, coupons, sales reminders, and receipts for things we need to return. (I hate showing up at IKEA/BBB and realizing I left returns stuff at home!!) We really just don’t leave the house without glancing through the stack. Davis is such an organized town – we get coupon books every quarter! There’s always “$3 off Supercuts” or “20% off @ Ace” – so this approach to retailing was an easy habit to start here. That’s what we did with Macy’s since we registered there for our wedding. Well, we kept all the gifts, just returned duplicates and such. It worked out well as so many other people register there, too, so I think we’ve used all our store credit and just have one card left now. That is a good idea to combine gift cards with coupons and deals and such – same idea and only one place to check! My wife and I make a game out of spending our gift cards. We’ll drop off the kids at Grandma and Grandpa’s, and then try to have a date entirely out of gift cards. Yes, sometimes you end up at JC Penny’s and some other weird places, but it’s cool to go home at night knowing that you basically didn’t spend a dime! That behavior is so outside our normal mode of action that I think it would stress us out! I’m glad you guys enjoy it, though. We immediately regift them, unless it’s someplace we were planning on going right away. In terms of me being a pain to shop for, what I do is have a substantial Amazon wishlist. Anytime there’s something that I want, instead of buying it, I pop it on the wishlist and at Christmas or my birthday people don’t have to think about what to get me and I get things I wanted. My sister hates it, but everyone else seems happy with the system. I do this for Christmas for my parents and siblings, which is the only time of year I am really expecting gifts. (Sometimes they pop up for birthdays/anniversaries, too, but less frequently.) This was the first year I was able to convince my husband to give his wish list to my family. He has a very different gift-giving philosophy than I do. My family appreciates it. Wow, what a great way to increase or save on your budget. I guess having a gift card is a lot like having cash. Good that you have lots of options and a spread sheet to track them. That’s a good system. Right now I have $35 at Amazon I am saving for a camera purchase. I used to spend gift cards as soon as I got them, but we’ve since “evolved” (look! I used your word!) and really wait to use our cards. We make sure they don’t expire but we now use cards for stuff we were going to buy anyways. American Debt Project recently posted..Would You Invest in Tech Stocks? What Exactly is the “Tech” Industry Anyways? Keeping them in your car is an excellent idea!